In respect to other guests, please do not bring alcoholic beverages, we will be keeping a dry camp. however, this is an additional expense, check with the airlines. purchased in Ketchikan or on the island if necessary). 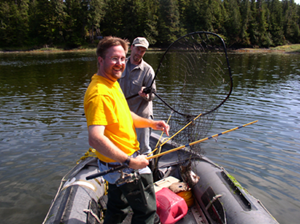 See Fishing Info for more on tackle. Snagging hooks #8 treble with 2 ounces of lead, or you can buy them at camp for $1.00ea. If you have special dietary restrictions let us know ahead of time.